Breathe Deep is a commission for the Denver Theatre District | Denver Digerati, 2014. “Breathe Deep” é um filme sobre uma escultura virtual que só poderia existir no reino do digital combinado ao natural e sintético, humano e avatar, planta e máquina. Uma figura feminina distópica e um monte de detritos se fundem. Ela é um ecossistema arquitetônico virtual feito de gifs, modelos 3D, plástico e líquidos falsos. “Breathe Deep” is a film about a virtual sculpture that could only exist in the realm of the digital combining natural and synthetic, human and avatar, plant and machine. A dystopic female figure has become one with a pile of debris. 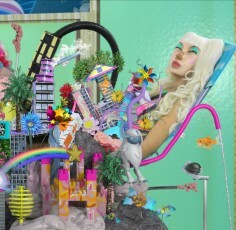 She is a virtual architectural ecosystem made of gifs, 3D models, plastic and fake liquids. Torn’s hybrids offer a vision of new forms and substances that fuse organic and synthetic materials. Female cyborgs are presented as Frankenstein-like monoliths; the surface of their bodies smooth like plastic dolls or skin treated by reconstructive surgery. Elements comingle in an uncomfortable conflation of innocence and adulteration—playful, childhood toys rendered in soft pastels reside in toxic, apocalyptic environments. Operating in close relation to the “natural” world, biomorphic forms excrete and ingest brightly colored liquid into and from their surrounds, suggesting a life-force akin to oil or blood. Myopia’s Toil features a newly created digital sculpture for Art in General’s Musée Minuscule to be viewed through 3D glasses. Combining built and found 3D models, Torn collages disparate items: plant foliage, derricks, and anime characters with exaggerated features. In an alien landscape reminiscent of video game environments, a looping narrative unfolds of evolution, self-destruction, and regeneration. Katie Torn (b. 1982, New York, NY) builds fantastical virtual totems and experimental video works using tools commonly employed in commercials and Hollywood films. Past exhibitions and screenings of her work took place at the Museum of Contemporary Art, Los Angeles; Hyde Park Art Center, Chicago; Postmasters Gallery, New York; Bitforms Gallery, New York; Union Docs, Brooklyn; Andrew Rafacz Gallery, Chicago; Eyebeam, New York; Interstate Projects, Brooklyn; the Susan D. Goodman Collection, New York; NYU Commons Gallery, New York; the Roots and Culture Contemporary Art Center, Chicago; Tritriangle, Chicago; and Space 1026, Philadelphia; Outlet gallery, Brooklyn. Torn was the 2013 Visions Fellow at Eyebeam and was recently a resident at The Institute of Electronic Arts, Alfred NY. She is currently an instructor at Pratt Institute, New York.